Hi well before heading for what all this is about. Let me ask you few questions. Have you ever thought that you should find some alternative, so that you can control you 2 machines on your desk with a single Mouse and Keyboard? You wanna share files between those two rigs and Copy paste? I had a question too – How can i control all my 3 machines with a single mouse and keyboard on the desk? Well when i had 3 machines on my desk. I really had this thought. A project developed in the Garage and released in September 2011. 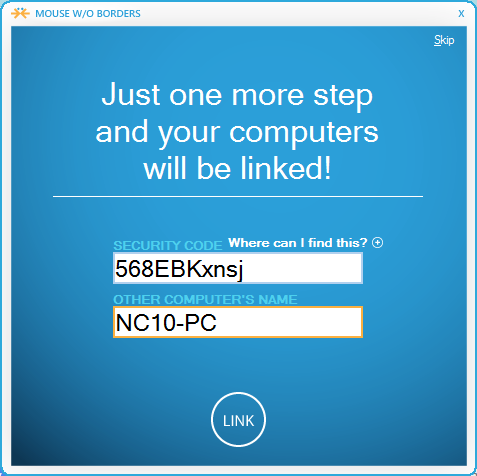 The software can allow a single mouse and keyboard to control up to four computers and as I discovered is ridiculously easy to install and use. And I still have the ability to share the clipboard between my computers and copy files from one to the other which is something I do all the time while I blog and develop apps. 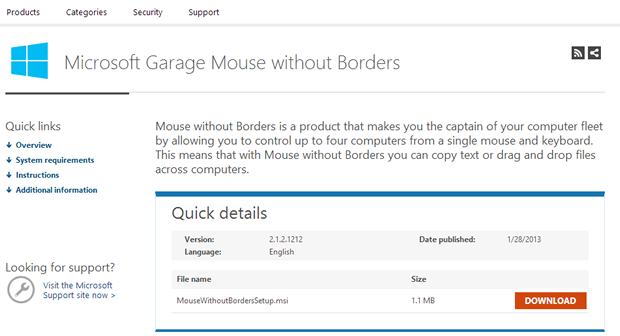 You can download your free copy of Mouse Without Borders by visiting the Microsoft Downloads Page. Now to use a single mouse and keyboard across multiple computers, you need to install this software on all of those machines. The installation is very much as you would expect and you can get up and running very quickly – the only thing to keep in mind is that you need to click through a UAC confirmation. Follow the instructions on the screen to install will complete it in about a minute. Click Finish and the program will automatically start. For now we’ll work with the computer whose mouse and keyboard you want to share with other machines. Click Yes to indicate you’ve installed the software on at least one more computer. You’ll be prompted to enter a security code and computer name, and for this you will need to turn to your second computer. Now time to install it on our second machine. After installing. The wizard to setup will appear. On this machine, click No and cancel the wizard before right clicking the system tray icon and selecting Settings. Make sure that the ‘Show text’ box is ticked and make a note of the Security Key and computer name so that you can enter it on your first computer. Now once done with the setup, close the wizard and you can then configure the physical arrangement of your screens. If you have ever configured multiple monitors, you’ll find that this is a very similar process. 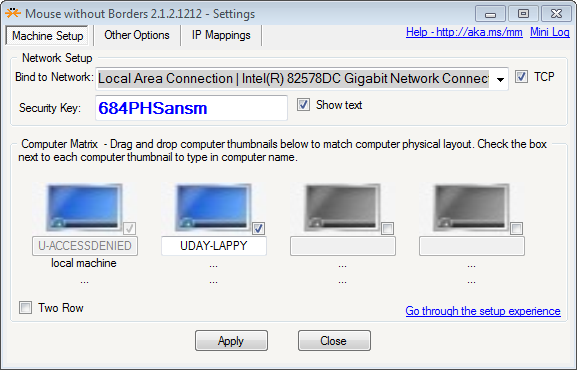 The Settings dialog displays an icon for each of the computers you have selected to connect, and you can drag and drop these icons into position so they are positioned in the same way as your computer screens in relation to each other. Click Apply and you can then move the mouse off the edge of one monitor and it will appear on the other screen. But there are also a few more settings to investigate. 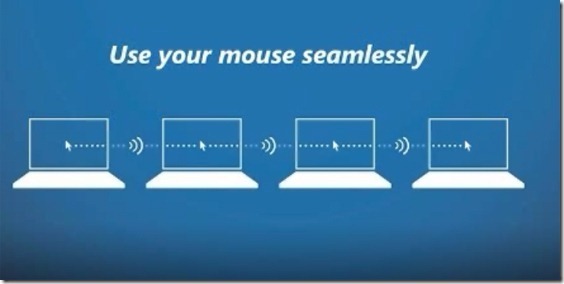 You are now ready to use your mouse without your screen borders across all computers. Now time for some extra tweaks move to the Other Options tab of the Settings dialog and tick the Wrap Mouse box. This enables the feature which means that you can just keep moving the mouse cursor in the same direction and it will keep disappearing off the edge of one monitor and re-appearing on the other – no need to move back the way you came if you don’t want to. If you’re using Windows 8, the corners of the screen are used to call up the Start screen, Charms bar and other features, and you may find that you accidentally move between screens when trying to access these options. 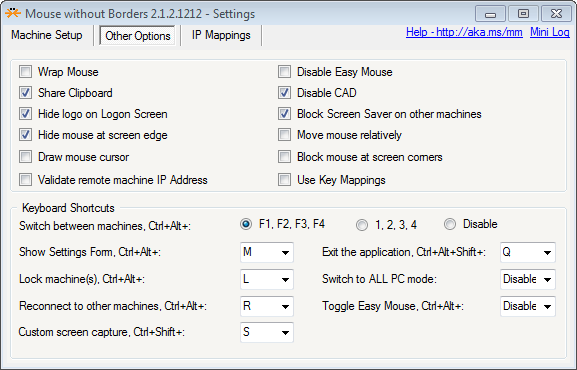 To avoid this you can tick the box labelled ‘Block mouse at screen corners’ to prevent screen switching in these areas. Alternatively, tick Disable Easy Mouse as this requires that the Ctrl key is held down while the cursor is at the edge of the screen in order to switch. Ordinarily you will move from one screen to another in the way described – by simply moving off the edge of one screen onto the other. But it is also possible to jump straight from one monitor to another without the need to travel with the cursor; this is great if you have a large monitor. At the bottom of the Settings dialog you can configure various keyboard shortcuts, including the ones you can use to jump from one display to another. Any computers you have connected to each other now share a clipboard. This means that you can copy text on one machine, switch focus to another and paste into a document – easy! So far we have only use the system tray icon to access the Setting screen, but it serves another purpose as well. Right click this icon and you can capture screenshots from any of the computers you have linked together. This means that there is no need to spend time moving the cursor to the monitor you’re interested in, and no need to manually copy and paste images between computers. Everything can be taken care of by selecting the ’Great Screen Capture from’ option and then choosing the computer you’re interested in. The screen capture option also works in reverse. 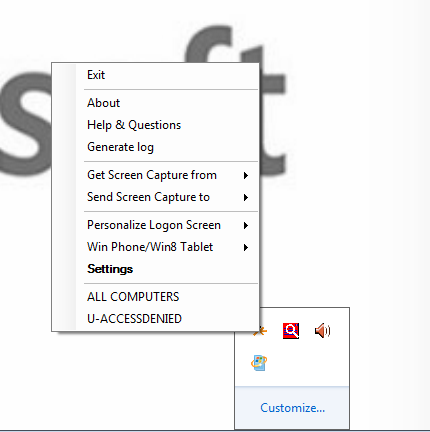 When you are using a particular computer, you can send a screenshot to another connected machine – just select the ‘Send Screen Capture to’ option. 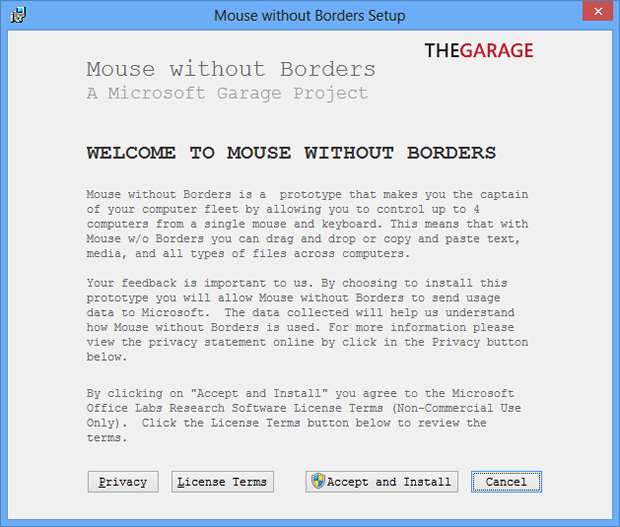 Mouse Without Borders is an immensely useful tool. It might come as something of a surprise that it is a tool associated with Microsoft, and even more of a surprise that it has been kept a secret. The video above both explains and shows Mouse Without Borders far better than I can using words. Try it out for yourself and please share your thoughts in the comments below. Microsoft is offering developers $100 for each Windows 8 and Windows Phone 8 app written between March 8 and June 30, 2013. Participants must be over 18 and live in the US. Up to ten Windows 8 apps and ten Windows Phone 8 apps per developer are eligible, which makes it possible to earn up to $2000. NOTE that developers must pay a fee of $49 per year for individuals and $99 per year for companies to list apps on the Windows Store, so that fee will come out of the first app. Read further and detailed Terms and conditions here. This is the link to Sign Up for the Program. A good news for Windows Phone 7.5 users. Getting an update soon.. Indeed, today Windows Phone Colombia has announced on Facebook that some of the devices running Windows Phone 7.5 will receive the upgrade to the next version starting from January 31st. Still there is no official list of dates for each device. This update adds some noticeable features such as new home screen with more room for tiles that also have the ability to resize, ability to set Bing as the lock screen wallpaper, 20 new accent theme colors for better personalization and Kid’s Corner – which will allow children play games without accessing your personal information. As January 31st is the start date for the Windows Phone 7.8 update to roll out, but the update will come a little late because of the varied manufacturers. 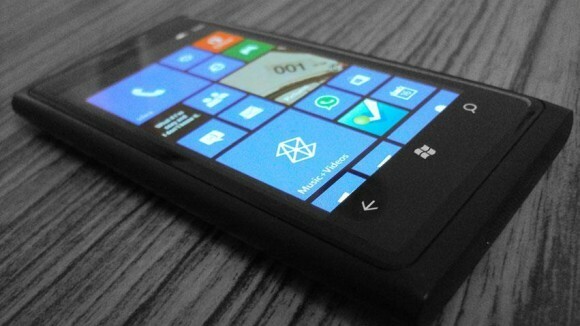 Hopefully, this will extend the life of existing phones with Windows Phone 7. However, these devices will still not have access to the new apps from Windows Phone 8 store as the devices may not be compatible enough.